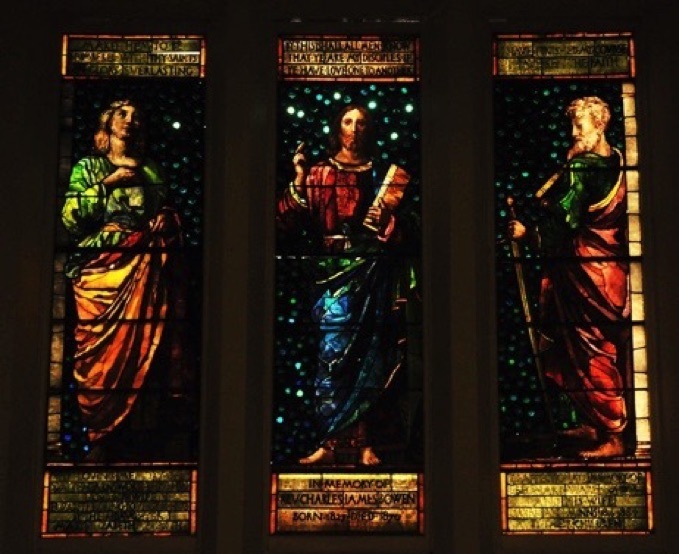 In 1889 John La Farge designed a triptych depicting St. John the Evangelist; Christ Preaching and St. Paul the Apostle, for the All Souls Unitarian Church on Warren Avenue in Roxbury, MA, the same year La Farge was awarded the French Medal of the Legion of Honor for his contribution to art. 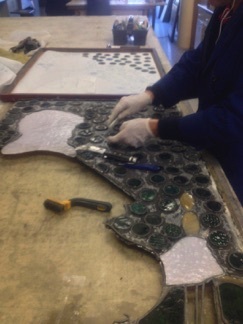 Serpentino Stained Glass has been trusted with the tedious task of restoring and conserving the three La Farge windows to be displayed at the McMullen Museum in 2015. The background of these windows was fabricated using a field of large (1-1/2” in diameter) round turquoise cabochons. 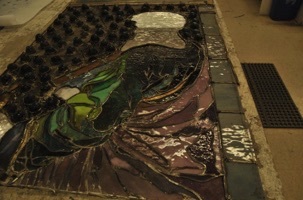 Sheets of lead were laid out and holes cut through the lead to allow light to illuminate the cabochons. Each cabochon was then wrapped with small lead came and soldered to the sheet lead. On the obverse side, each cabochon was then plated with different shades of blue and teal glass. 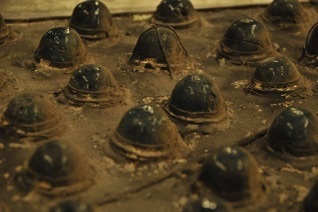 Interior view of cabochons before restoration. 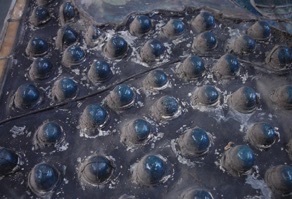 Exterior view of cabochons before restoration. 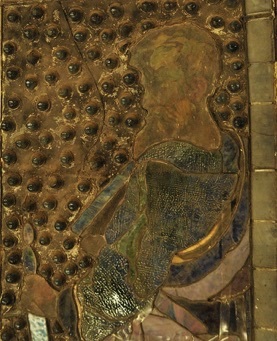 Interior layers removed from panel depicting St. Paul. *NOTE: Most of the base layer lead matrix was saved and reused. Only the lead in the large highlighted border was replaced. 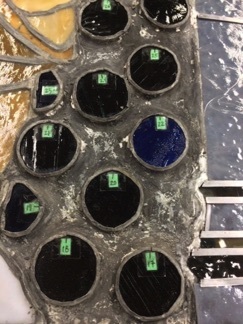 The sections of the panels with the cabochons were carefully separated from the figural sections (see photo on the left), in order to ease the flattening process. 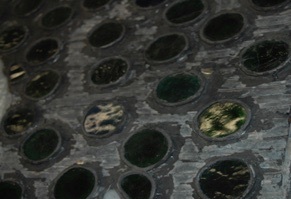 The cabochons were plated on the exterior with different shades of blue and green glass. 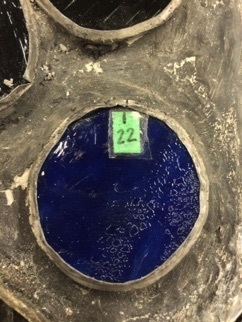 Each plate was numbered and its orientation marked on the glass as well as on the lead to insure that they would be reinserted correctly. 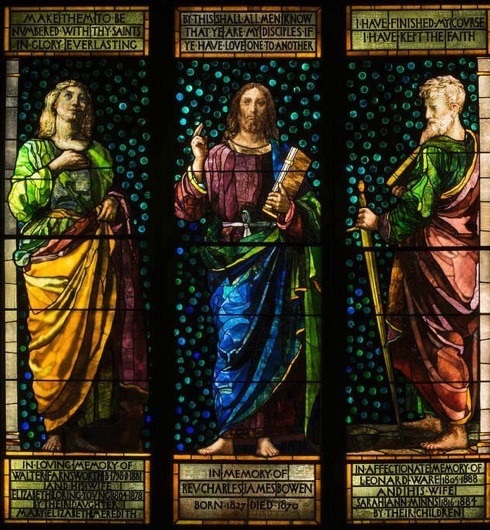 The conservation of the three windows was completed in August 2014 and it is currently on exhibit at the Mc Mullen Museum at Boston College.